So you’ve got some customers in your business now. What’s next? Should you go out there and acquire more customers? Well, before we answer that question, let’s go over what lifetime value of a customer is. My goal with this post is to help you learn about or further increase your knowledge of what lifetime value of a customer is, why you should care, how to measure it, and how to increase the lifetime value of a customer. So I will break this post down into those four sub-topics. Question #1: What is lifetime value of a customer? Essentially, what lifetime value means is that over any arbitrary timespan, how much revenue does a customer on average generate for your business. So for example, if a customer spends $10 with your business on day one, then for that specific customer, the lifetime value is $10 on day one. Now imagine that the same customer comes back and spends $10 more with your business on day ten. The lifetime value for that customer is now $20 on day ten. You can use any timespan you like, just make sure that they make sense for your business. The more granular you get, the more redundancy you may get in your data, however, space them out too much and you may lose some valuable data. It is also advised that you use multiple timespans so you can start to get a sense of how much on average each customer spends with your business over the long-term. Personally, for fast-paced online businesses, I like to measure the lifetime value every week. So how much did a customer spend on day one, then day seven, then day fourteen, and so on. If the business is somewhat slow-paced, say a SaaS company, then I like to measure the lifetime value every thirty days as most SaaS based companies operate on a monthly billing service. Now that you understand what lifetime value is, why should you care? Let’s move on to the next question. Question #2: Why should you care about lifetime value of a customer? If you’re thinking that it’s just a cool metric to have in your business and that’s the only purpose of measuring lifetime value, you are going to be leaving a lot of growth opportunity on the table. Essentially, if you know how much money a customer will spend with your business over any arbitrary timespan (LTV) and you know how much it costs on average to acquire a customer (CAC), you can easily check to see if your business is profitable. Not only that, you can start to see how long it takes before your business is profitable. This can be extremely valuable data to use if you are trying to pitch your company to a venture capitalist and raise money. So for example, let’s say that you run an online course that teaches people how to stay productive for longer and learn more in less time. 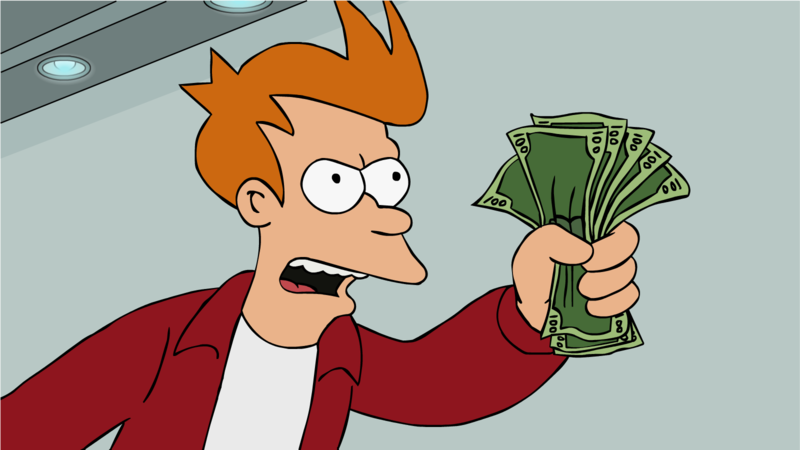 Imagine that it requires you $20 to get someone to enroll into your introductory course which is $5. Most marketers would just stop right there and discontinue that marketing campaign because it’s simply not profitable. You’re spending $20 to make $5. Who in their right mind would put $20 into an ATM and want to get back $5? No one. However, they are missing the point here. They are attempting to day-trade attention, trying to acquire more customers and optimize only for day one value of a customer. They are not trying to build an audience and provide them with massive amounts of value. I wrote another post that goes over the four benefits of building an audience and how it can drastically improve your business. One of the points I made was that by providing lots of value and building an audience, your customers will become more valuable over time. What does that sound like? Sounds like you’re increasing the lifetime value of your average customer. So yes, you might be losing $15 per customer, however, you have their attention now. This is where you must provide massive amounts of value through the introductory course to leave an amazing first impression of your brand. Go above and beyond with the content. Create a community on Facebook to help answer their ongoing questions. Host private webinars or release new tips every week. Something to make that introductory course feel like the best introductory course to ever exist. Now you’ve built massive respect, trust, and rapport with your target audience. They know your brand, they’ve invested time in learning from you, they love your content, they’re familiar with your face. Then on the third day or after they’ve been through a certain percentage of your introductory course, you offer them a course that will help solve their productivity problems for $50. You are offering them this advanced course after you’ve built respect, trust, and rapport with your customer base by giving them value. 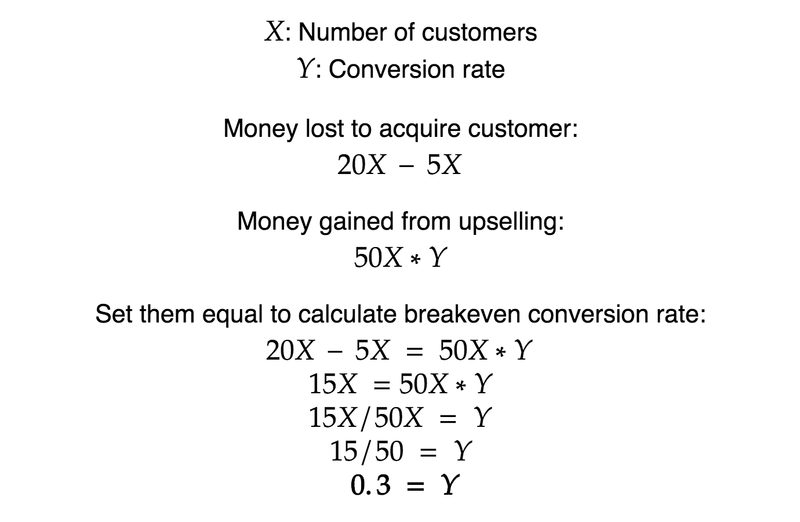 If you do the math, you only need a 30% conversion rate to breakeven on your marketing efforts and recover the $15 you lost on each customer that signed up. Keep in mind, you own the audience, so if you don’t hit 30% the first time around, you can give them even more value and then offer them the $50 course again and include some psychological biases such as urgency bias. If you’re measuring the lifetime value of your average customer in weekly periods, you will know after how long your business will become profitable. Furthermore, you can provide even more value in your advanced course and further grow your audience. By having this information at your disposal, you can be much more confident about your marketing efforts. You may lose money in the beginning, however, you’ll make that money back AND have a loyal customer base that loves your brand. While your competitors are out there trying to flip their marketing dollars, you’ll be over here providing as much value as you can to each customer so that over time, your business becomes profitable. So hopefully by now, I’ve convinced you that knowing your numbers for lifetime value is important, let’s get into how you can measure for lifetime value. Question #3: How can I measure lifetime value of a customer? If you have an online business, this will be far easier to accomplish, however, if you do happen to have an offline business, don’t worry, by getting creative, you can achieve this as well. By having an online business, you can keep track of each customer and assign each a customer ID. You can then record when they first become your customer to serve as the starting date. Next, you can create a table that tracks all of the purchase history on your website. Make sure that this data can be filtered by the customer ID. You can then have an algorithm that calculates what the lifetime value of each customer is for a certain timespan. After you’ve calculated the lifetime value of each customer, you can then aggregate the data and get your final answer: your average lifetime value of a customer. If you are not a programmer yourself, you might need to hire one to help you accomplish this. Don’t worry, the upfront cost is well worth how much money you can make in the long-term. Additionally, I offer these programming and data analytics services to businesses as well. If you would like to work with me, click the ‘Services’ tab up top and fill out the form. I will get back to you with a free database architecture and a quote. If you have an offline business, you can try to replicate this, however, some businesses, like restaurants, don’t assign IDs to customers, so there’s no way of identifying who made a purchase at what time. In this case, you will have to get creative. Brick-and-mortar businesses in the past have tried to accomplish this by giving out punch cards with unique IDs or by having a loyalty program. Some salons will take your name and phone number to keep track of how many times you’ve been to the salon. Bottom line is, you’ll have to get creative with measuring the lifetime value of your business. This might even lead to you giving more value to your customers (free stuff from punchcards is value). Now that you have a good idea on how to measure lifetime value, let’s get into the four ways of how you can increase lifetime value of a customer. Question #4: How can I increase the lifetime value of a customer? The short answer is to give your customer more value. However, that short answer is vague and it doesn’t provide you with actual tactics and strategy, so let’s get into the four ways to increase the lifetime value of a customer. Develop a product or service with your customers: People love to have their voice heard. If you can listen to what your audience has to say about your products and services, you can start to gain valuable feedback on how to improve existing offers which can reduce churn and produce customer retention. This can also help you come up with new products and services that can better solve their problems. Create products and services that are related: Say a customer comes to your online tennis shop and buys a tennis racket. They might also need tennis balls, tennis shoes, tennis bags, tennis whatever. By just having these related products, you increase the chances of you making more money per customer. Create “add-on” products or services which can make solving the problem faster or easier: Imagine that you are learning about marketing funnels because you have a marketing problem in your business. You go out on the internet and first consume free content to increase your awareness. You stumble across my marketing blog and I give you a lot of free valuable information. You want to learn more, so I sell you my $4 book. You learn all of my marketing strategies and my mindsets, however, now you’re stuck at implementing what you’ve learned. Not to worry, I also developed a $27 a month software tool that does every single thing I talk about in the book. Now you’re taking action to solve your marketing problem, however, since you lack experience, you don’t get results right away. Your boss is breathing down your neck to solve this problem in time. Not to worry, I offer my marketing expertise to you for just $500 a month, promising to fix all your marketing problems right away and make back your $500 every month. What I’m doing is selling you based on your urgency. If you’re just browsing around, you just want some free stuff. Once you’re a bit more aware and urgency starts to develop, you will start to buy products and services. Have your business ready for every level of urgency. Lure customers in with low prices, overdeliver on service, and then sell them expensive products: This strategy is one of the more riskier ones because you’re guaranteed that you will lose money in the beginning. However, it is also the most powerful one. It’s the same strategy that Jeff Bezos has used to grow Amazon. For a very long time, Amazon would sell products way under market value and they were obviously losing money on these products, however, they wowed customers with quick two-day delivery and exceptional customer service. They made the products cheap and sold you on their service and brand. Amazon now makes their money back on your attention in multiple ways. They’ve also become a cultural norm. If you want to shop online, where do you mostly go? Amazon. You can mix and match any of these methods to start increasing how much money you make with each customer. Just keep in mind though, whatever product or services you sell, make sure that they are high quality and actually do what you promised and more. If the customer feels like they’re not getting their money’s worth, they’re going to leave and your lifetime value will start to drop. By understanding how much it costs to get a customer on average and how much money on average a customer will create for your business, you can get a better sense of how profitable your business is over a given timespan. It will make you more confident with your marketing efforts, incentivize you to give more value to your customers, and make your business more profitable in the end. So back to the original question, now that you’ve got customers in your business, what should you do next? 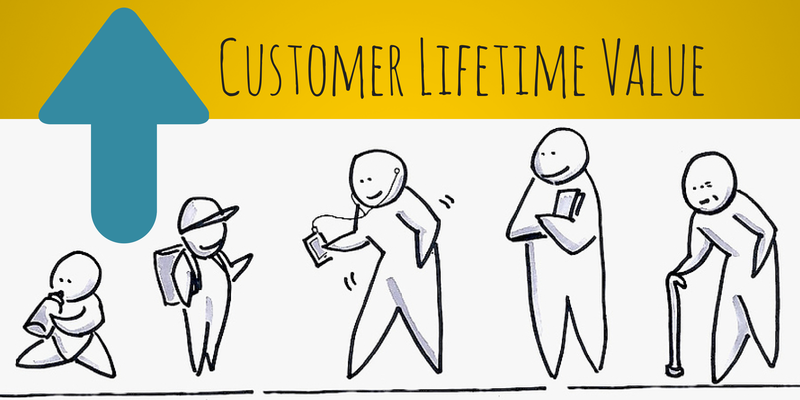 Pretty obvious now, you need to increase the lifetime value of each customer! If you’d like to further discuss how you can start to incorporate this “value-first” mindset into your business, feel free to contact me, it’s @sunnychopper on pretty much every social media platform out there, even Xbox Live.